Yin: feminine, shadowy, receptive, compassionate. At this moment, slicing pears for a vinaigrette dressing, I think that cooking is yin. I feel like I am receiving the grace of Annapurna, the goddess of kitchens and food. Kitchen wisdom has traditionally been thought of as feminine. Not being a scholar, I don’t thoroughly understand the concepts of yin and yang. Years ago, a therapist told me I was too yang, that I needed to be or have more yin, more feminine energy. I did not tell her to go to Hades. That would have been too yang. But when a boyfriend told me that the only time I was soft was in the bedroom, I did not bite my tongue. Is it yin to express my personal thoughts, or is it aggressively yang? What did that therapist mean? Was I too aggressive in my desire to be liked? Was it my anger (and at that time I was quite the angry woman)? Too pushy in my efforts to participate in an unbalanced culture while looking for work? I did not see myself as having such an overabundance of male energy. I thought I was pretty soft. Truth is, it seemed like I was unhappy a lot of the time. Ah. Shadowy. I’ve thought about her words over the past couple of years. A serious illness puts a certain spin on things. Thanks to my overabundance of aggressive energy, I have been able to stay afloat emotionally and physically. (Lord knows, the health teams in the nursing facilities I experienced were not capable of helping folks to really heal.) Thanks to my compassion, a yin quality, I was able to help make things better for other patients. I think this therapist meant to say, “you are out of balance.” She saw my aggression in my efforts to not have people take advantage of me. I went overboard and gave up my ability to receive the good that was being offered. The world appeared to be all or nothing, a flip-flop between angry defensiveness and tearful resignation. Ah. Desperately seeking balance. I’m following the foggy path, pushing aside emotional weeds, and looking for the bright clearing. 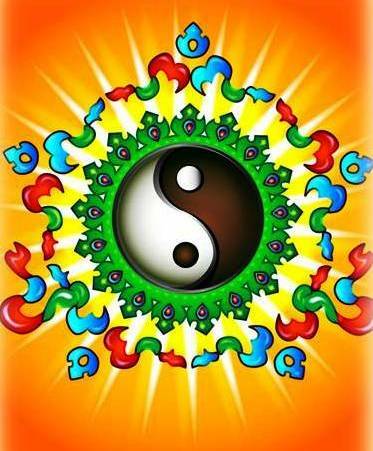 Yin and yang are the male and female of all things: light and dark, positive and negative, sunny and cloudy. We exist in a world of opposites; sometimes opposites attract, sometimes they repel. But we cannot exist without both. If we are to survive and thrive, we must be balanced. It seems to me that balance is an inside out proposition. There can’t be balance on the outside if it doesn’t exist within. I once left a retreat pissed off at the expressions of unconscious racism. Things were out of balance. There were only a few African-Americans present, and I have always been impatient with the fact that white people assumed we all lived the same kind of lives in the mid-20th century. We did not, oh, we did not; our lives were very different. Things were not equal. Communities were separate. And so, I lost my patience, not only with the expressions of yet more unconscious assumptions, but with trying to be an educator. So. I drove to a spot near the bay and screamed at the sea, the rocks, and the trees that had bent almost to the ground from surrender to the wind. Surrender. The trees were able to surrender, and they bore their evidence of — beautiful, too — survival. There was balance in that surrender. But to what would I surrender? I could not scream at people and achieve what I wanted to achieve, so I screamed and cursed at the sea. I got out of my car. I got back in my car. I got out of my car. There were a million stars in the black sky. The mist wetting my face was cold. The night was both scary and lovely. I was fed up with trying to please everyone around me. I was tired of trying to replace people’s ignorance with information. I was angry and wanted to receive — something. What? Everyone around me seemed aggressive, and hard — filled with what I identified as male energy. That was my voice. It wasn’t the first time I heard my voice and those words. “…softness around me.” Softness, compassion, the ability to receive and accept love. A little more yin. Perhaps that’s what the therapist was saying. The night provided a quiet opening, a soft space wherein I recognized both my power and my surrender. As the ocean was both yang and yin, so was I. Balance. Before that night, I loved the ocean. Now, I swore to worship her. Ours is a society of pushing and aggression, an amazing hermetically sealed bubble in which we are prone to swing to extremes: prohibition or uncontrolled excess; compassionate sharing or the complete hoarding of resources so that only the wealthy thrive. We have not been raised to live in balance. It is a concept as foreign as yin or yang. I, for one, am of the opinion that in the stillness of making pear vinaigrette dressing lies surrender to the softness of balance. This entry was posted in Writing from the heart and tagged balance, creative nonfiction, essay, Feelings, feminine, Life Stories, opposites, Reflections, surrender, writing from the heart, yin yang. Bookmark the permalink. What a really thoughtful post that comes out of a lot of self-knowledge and experience. Really beautiful. Thanks, Luanne. I really enjoy your blog. Keep up the great writing. I think I’m missing a little Yang—for myself anyway. I can stick up for other people just fine—as evidenced by my choice of profession (lawyer–often for fairly voiceless folks). I think the world is generally unbalanced and has been throughout history. I’ve seen photos of Turkish soldiers tenderly holding Syrian refugee children and then there’s ISIS (ISIL?) who seems to think brutality is the answer. (They may think that’s working for awhile, but ultimately, everyone will hate them or if they’ve managed to exterminate those they think unworthy (Shias, Jews, Christians, insufficiently orthodox Sunnis, etc.) those left will be just as ruthless as they are). I guess I’m kind of off topic here. You are talking about your Yin and Yang and that of other individuals. I think it keeps coming back to living the Golden Rule–treating others the way you wish to be treated/regarded. You just have to accept the fact that if you live that way, sometimes you will have to/want to howl at the ocean. Wishing you courage and peace, my friend.